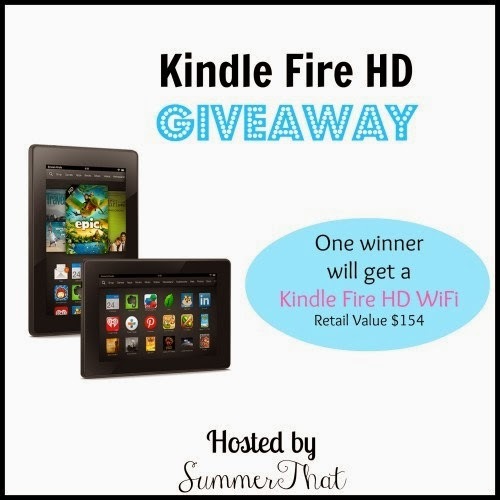 Coolestmommy's Coolest Thoughts: Kindle Fire HD #Giveaway! What is your story? Do you enjoy reading? If so, do you prefer paper books, reading on a device or a combination of both? I still love the feel of paper books in my hands, but I own a Kindle myself. I find the Kindle (and the Kindle App on my smartphone) the perfect way to read when a paper book isn't available. The Kindle is small enough to fit into my purse so even standing in line at the grocery store, I can be found reading a book. I'm an avid reader and my husband claims I get the shakes if I don't have a book on me at all times. When I had the opportunity to join in on this Kindle Fire HD Giveaway with Summer That, I knew I had to be a part of it. Have you seen all the versatility you get with a Kindle Fire? You get reading power, plus the benefits of a tablet without having to purchase another device. Giveaway ends February 17th at 11:59pm, open to US and Canada, ages 18+. Disclaimer: The participating bloggers were not compensated for this post. We are not associated with any of the companies named above. No purchase is necessary to enter. One entrant per household. Void where prohibited by law. The odds of winning are based on the number of entries received. Confirmed Winner(s) (by Random.org) will be contacted by email. Winner(s) have 48 hours to respond before a new winner is chosen. SummerThat.com will be responsible for product shipment to winner(s) of this sweepstakes. Co-hosts and other blog participants are not responsible for product shipment/delivery. This event is in no way administered, sponsored, or endorsed by, or associated with, Facebook and/or Twi tter, Google, Pinterest. This disclosure is done in accordance with the Federal Trade Commission 10 CFR, Part 255 Guides Concerning the Use of Endorsements and Testimonials in Advertising. Please contact SummerThatBlog@gmail.com with any questions or to see your business or blog featured on the next big event! i'd give it to my boyfriend so he quits using mine all the time!! haha!! he uses it for Facebook, Twitter, game apps, and of course (free) kindle books!